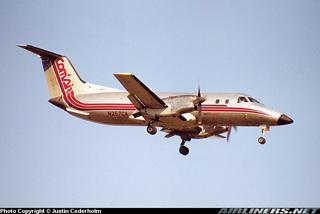 On January 9, 1997, an Embraer EMB-120RT, N265CA operated by COMAIR Airlines, Inc. as Flight 3272 from the Cincinnati/Northern Kentucky International Airport, crashed during approach following an uncommanded roll excursion and rapid descent near Monroe, Michigan. All 26 passengers and three crew members were killed. The airplane was destroyed by ground impact forces and post accident fire. The NTSB determined that a combination of ice accumulation on the wings and low airspeed with flaps retracted resulted in adverse effects on both lift and drag, leading to a loss of control after automatic disconnection of the autopilot. The airplane entered an extreme nose-down pitch attitude from which the crew was not able to recover.